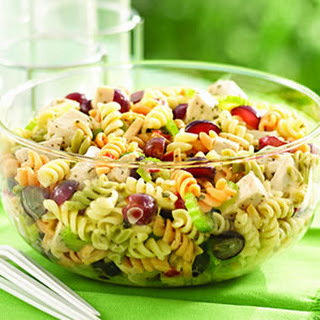 While pasta is cooking, toss chicken, grapes and pineapple together in a large bowl. In a medium bowl, stir together mayonnaise, lemon juice, orange juice concentrate and curry powder. When pasta is cooked, drain well and stir into fruit mixture. Stir dressing into pasta and fruit and mix well. Sprinkle scallions over salad and serve.